"These crispy, crusty, delicious potato pancakes are nothing more than cold instant mashed potatoes shaped into patties and browned in butter. A sprinkle of chives adds color and flavor." Whisk together water, egg and salt in a large bowl until salt has dissolved. Stir in dry potato flakes until incorporated. Stir in 1 tablespoon of chopped chives; season with black pepper and cayenne pepper. Heat oil and butter in a large skillet over medium-high heat. Swirl the pan to combine. Divide potato mixture into four equal portions and shape into pancakes. Place the pancakes in the pan and reduce heat to medium. Cook until a well-browned crust has formed onto the bottom of the pancakes, about 10 minutes. Flip each pancake and flatten slightly. Cook until other sides are browned, 7 to 8 more minutes. 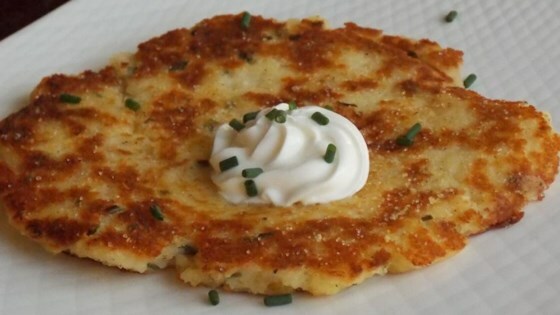 Transfer to plate; top each pancake with a dollop of sour cream and sprinkle each with 3/4 teaspoon chives. Simple recipe for potato cakes. You have to let the water absorb into the potatoes first. Divide the mixture up, roll into small balls, then shape the pancakes with your hands. thanks, my children them love.I add crushed garlic and sliced bacon . best recipe!